Please contact Vicky (vic.kennedy@hotmail.com) for more information about this pet.I am fostered in San Antonio. I was picked up in San Antonio and taken to SA ACS. About a week later I was rescued from there and went to my foster home. My foster mom calls me Fever. I think she said it had to do with “White Line Fever”. Or was it “Cat Scratch Fever”? Maybe it is because I am just so hot! Look at me; you just have to agree. When I first met my foster brother we got along great. Not so much with his sister but I think that is on her and not me. Now she plays with me almost as much as he does. I also get along with young kids and let them carry me around. Anything to be a part of the family. If you adopt me and you have other playmates for me (oh goodie), but I would really like my own bowl for dinner. That is one thing I don’t like to share. I might be smaller and younger than them but I can cover their bowl like nobody’s business (and it’s a big bowl). I’m not mean about it, I just mean business and they wait their turn. I love sitting in “mom’s” lap or on her shoulder in her favorite chair. Oh and I like to know where everyone is. I’m not real vocal, I chirp mostly, but I do like to stay close by; you need to walk carefully. If I can’t find anyone, I cry out for them. Call me to let me know where you are and I will come running. It’s great to be loved and accepted. My foster mom loves me, so much so, she wants me to have a very special home of my own. Maybe that home could be yours.Update: Fever was adopted but then brought back when he turned one. He was beating up the declawed geriatric original pet. When I got him back I was neverous and it took about 3 days for everyone to calm down and become friends again. He is one month younger than my two and they all get along fine. He also plays with Sheila who is about four months younger. He does like to play and he and Xena get a little noisy but everyone else plays quietly. No one has been injured.Fever loves alone time in my room with or without me. He loves to sit in my lap or at my head on my chair. He is a very loving cat and loves human companionship. 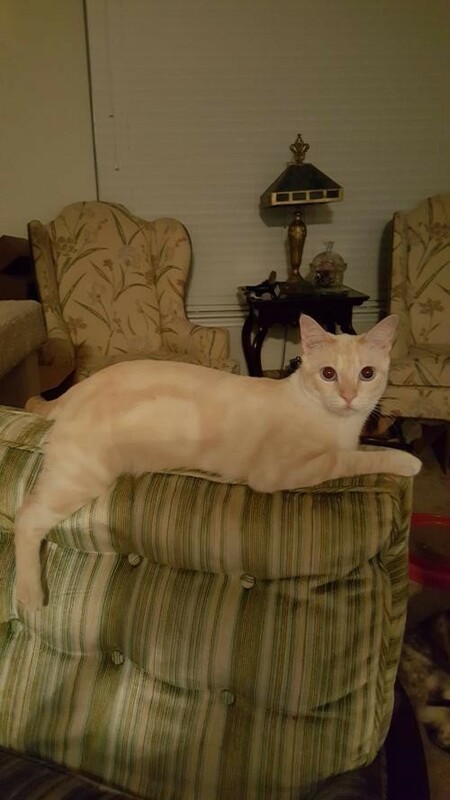 He still has his beautiful blue eyes and he now has beautiful flame point markings. He is not so agressive about eating and I have to have a separate area for him to eat or my two would eat it all. The only time he meows is if I am in my room and he is not. He also bangs on my door. He chirps when he is happy. He will be great as an only cat or with young playful cats.Visit this organization's web site to see any additional information available about this pet.